As an SEO professional, website owner or an internet user, you must have heard of the term “URL”. We have been using these URLs from the time we did not even know what URLs are. We know them better by the name “web address” or simply “address”. If you are are a little tech savvy and have some connection with search engine optimization, you must have also heard the about the term “SEO URL” or “SEO friendly URL”. What are these SEO friendly URLs? And do URLs really matter in SEO? We will certainly get to that. But before we take the SEO factor of the URLs in consideration, it’s crucial for you to know what exactly is an URL and how they are made. 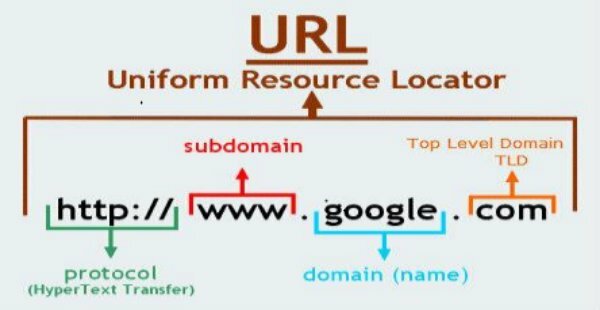 URL (Uniform Resource Locator) or simply call it “web address” is a specific medium of locating the resources on the internet. The same URL also defines the way these resources are retrieved from the sources, also called as “Protocol” such as HTTP, HTTPS, FTP, etc. The URLs were designed to make it easy for the human users to locate a specific resource on the internet using a human readable text format which replaces the numbers (IP addresses) with texts that can be easily remembered. Protocol: The protocol is the set or rules that define how the browser will retrieve the information from a resource. The web standard protocol is http:// or https:// where “s” stands for secure. There are others protocols like ftp: (File transfer protocol), SMTP, POP3, etc. Domain-name: Domain-name is the human readable text that specifies the location of the resource on the internet. Most of the times they are websites. Top-level-domain: It basically defines the category of the domain-name (website). You must be familiar with .com, .edu, .org, and .gov etc. It depends on the kind of website it is. Path: It is the address of the specific folders or sub-folders that are on the website. It is used to jump to the specific point in the resource. Why are SEO URLs crucial? Now that we have a decent idea of how URLs are made, let’s see how the search engine optimization part of these URLs is an asset for your website. An SEO friendly URL is nothing but the simplified form of the dynamically created URLs by your website or content management system. These URLs are easy to read by the humans as well as the search engines and one can derive the semantic relevance by simply looking at the URL. While search engines can read these URLs, but most of the time they give a hard time to the search engines either. And it’s nearly impossible for the users or even the search engines to derive a semantic meaning of the content on the web page through these URLs. A well-crafted URL provides both the human users and the search engines an easy way to read the URLs and derive the idea of the web page content. Here, even if the title tag of the page was hidden for some reason, the user could easily have a clear idea of what this page is about. It clearly gives an idea of the destination page where the user will be taken after clicking on the link. URLs are not much of a big signal for the search engines to determine the rank of a page in their SERPs. However, this minute factor can sometimes determine the relevance of the pages for the search engines like Google. In the past half decade, Google has moved from “keyword matching” to “semantic relevance” of the contents of the web page. So keywords used in the SEO URLs can help these search engines to determine the relevance of your web page with the search string. Though URLs don’t have much of the effect on search ranking, at least you will have an extra space to put your keywords in the URL. It’s worth thinking about rather than using the unformatted URLs. Moreover, Google does stresses on simple URL structures for many reasons. We share our website URLs on different websites, portals, and forums for linking and promotional purposes. However, there are various forums and portals which do not allow the hyperlinks using the Anchor texts. Knowband clearly mentions that it will take the user to a “free marketplace module for PrestaShop”. So, even if you share this naked URL without an anchor text, the user will understand what this link is about and it definitely has the relevant keywords to make the link natural. Keep the URLs as simple, relevant, and precise as possible. In this way, you can not only help the search engines read your URLs easily but also make it easier for the users to understand them. Moreover, you are allowed to use ID numbers and codes in the URLs, but the best practice would be to use words instead. Users can comprehend words better than numbers or codes. An SEO URL is always self-explanatory. A user should be able to comprehend and have a clear idea of the page’s content by looking at its URL itself. Such URLs generally get a high click through rate in the SERPs especially. So, always try to keep your URLs concise but complete in sense. If required use hyphens to separate the words. It is never recommended to use spaces, underscores and any special characters to separate the words in a URL. Google treats the words separated by underscores as one single word. For example, “the_single_word” is same as “thesingleword” to Google. So, to separate the words on your URL always use Hyphens; not underscores. An URL should always have lowercase letters. Using uppercase can cause problems with the duplicate pages. For example, yoursite.com/Contact and yoursite.com/contact are treated as two different URLs, and it might create duplicate content issues. In fact, if your site has some URLs like this which serve the same content for multiple URLs, the best option is to use a 301 redirect or canonicalize them. Use 301 redirects for multiple URLs serving exactly the same content. And if you intentionally wish to keep using the duplicate content for some reason, use canonical tag (rel=canonical). An URL having the character count more than 2,048 characters might have loading issues with some browsers and search engines. It’s better to keep the character count under 2,048 characters to avoid any issue. There is no rule that your URL must exactly match the headline of the page. In fact, it is a good practice to keep it concise and slightly different. For example, if your headline says “7 best practices to writing SEO URLs” it can be used in the URL as “7-SEO-URL-best-practices”. It’s not a thumb rule but a best practice to keep your focused keyword in the front of your URL. You should try to include the keyword in the first three words itself. However, beware for keyword stuffing and use only if it’s relevant. An URL properly structured to provide a meaningful comprehension of the page content and uses the best practices is always an SEO friendly URL. There are CMSs and eCommerce platforms that provide inbuilt control to write custom URLs for the pages. However, even those custom URLs will not be said as SEO URL unless they follow the right practices. So, it’s on you to make your URLs friendly and comprehensible to the users as well as search engines. Even in eCommerce website SEO, professionals always recommend using the friendly URLs for an improved UX more than just for SEO. URLs hardly have an effect on your site ranking, but they can give a dramatic result on your UX front if written wisely. How to catch low-quality links on your site? How to get traffic on your newly built website?